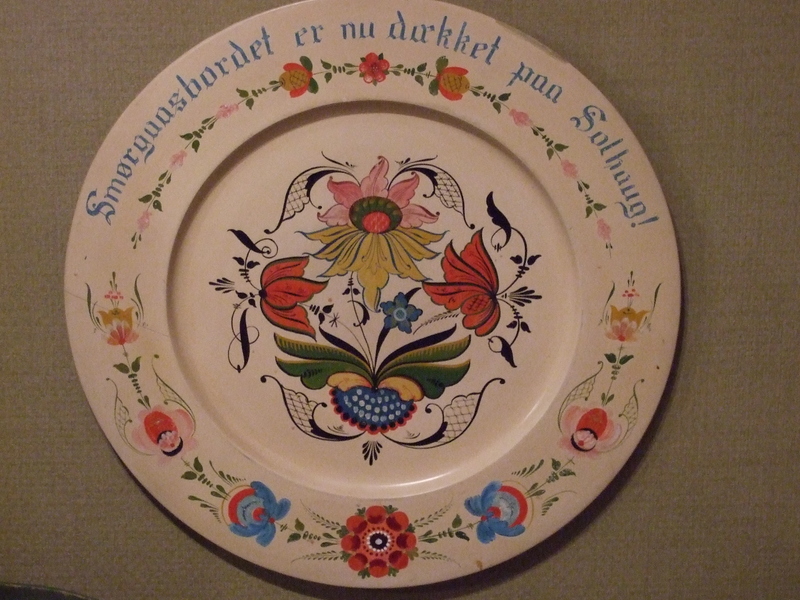 The Norwegian folk art called rosemaling is a form of decorative painting that dates back to the early 18th century. Styles varied from region to region in Norway, and was practiced largely by traveling painters in rural areas. Many immigrants carried painted bowls or plates or boxes in their trunks when they crossed the Atlantic. In the new world, the demands of starting new lives, and acculturation, led to a quick demise of the art. Those painters who immigrated earned their living in other ways. After some years, the painted pieces that made the trip took their place as treasured mementos of the old country… or perhaps were put to some mundane use, and eventually discarded. 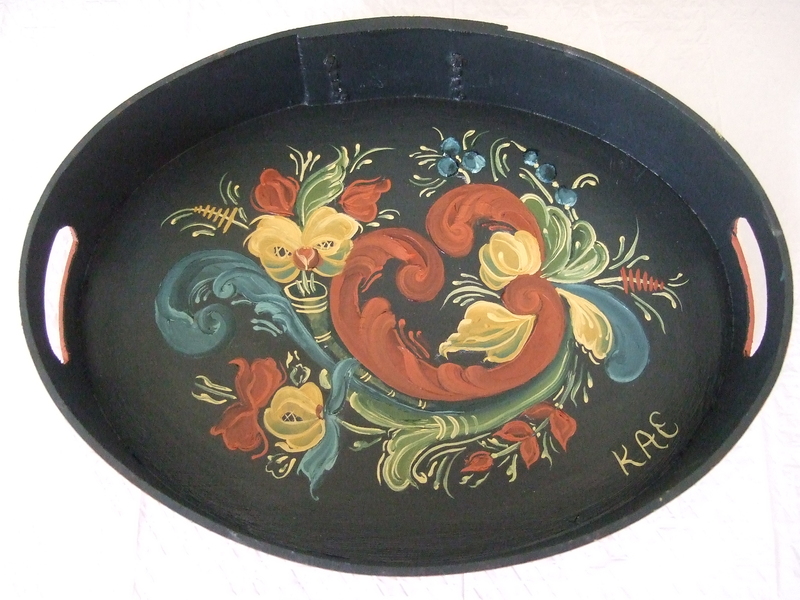 By the 1870s, rosemaling had also faded from favor in Norway. 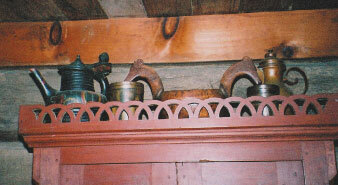 Ethnic pieces at the 1865 Kvaale House, at Old World Wisconsin, are relegated to a high shelf. 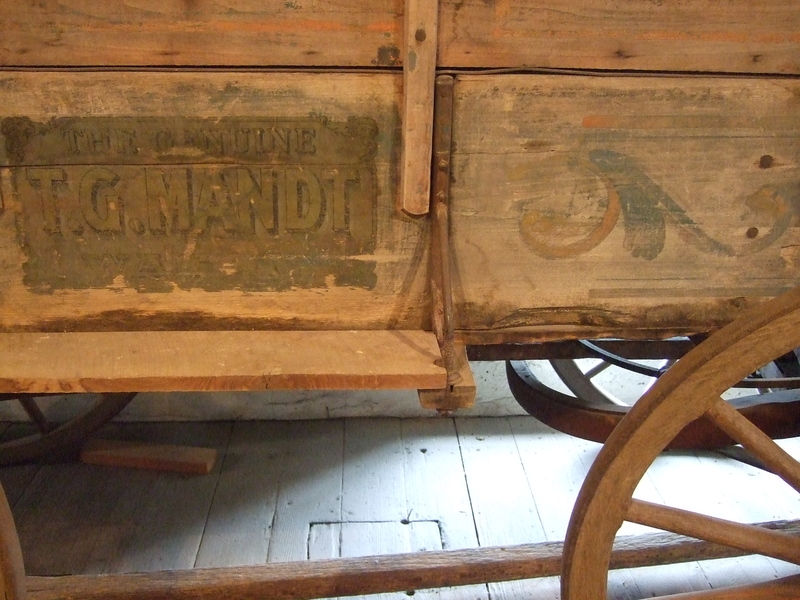 By 1865, the Kvaale family had been in Wisconsin for some time. A man named Per Lysne is credited with reviving the art in America. Lysne learned the art from his father in Norway before immigrating to Stoughton, WI, with his wife in 1907. 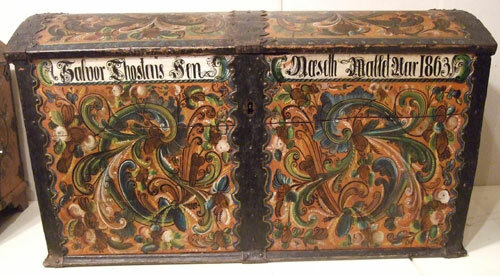 Lysne went to work at a local wagon factory as a painter, and was soon adding decorative flourishes to the finished wagon boxes. Here's a piece of agricultural equipment that was rosemaled. When the Great Depression caused the factory to close, Lysne was able to earn a living with his paintbrushes. He began by repainting some of the old and faded pieces brought to Wisconsin by his neighbors. Soon his work became popular in its own right. 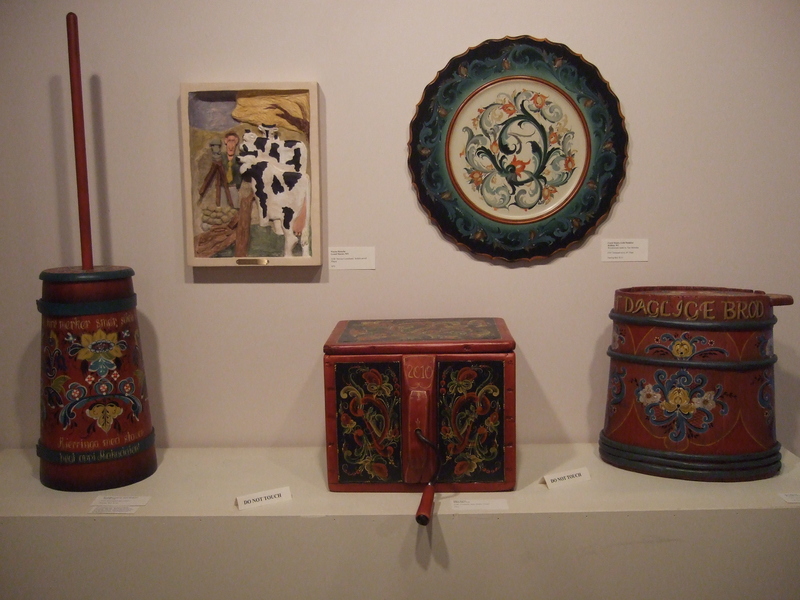 I was introduced to the folk art when I went to work at Old World Wisconsin in 1982. I was fascinated by the lovely painting. When I wrote Old World Murder, I chose to make a missing rosemaled bowl the heart of the mystery. My protagonist is a Norwegian-American museum curator named Chloe Ellefson. Chloe’s mom is an expert rosemaler. Knowing that this art will be touched on again in future books in the series, I decided I needed to learn more about it. That’s how I found myself in a beginner’s rosemaling class last week at Vesterheim Norwegian-American Museum in Decorah, Iowa. I had not held a paint brush since I was in middle school, when my art teacher made it clear (and not politely, either) that I had no business taking an art class. 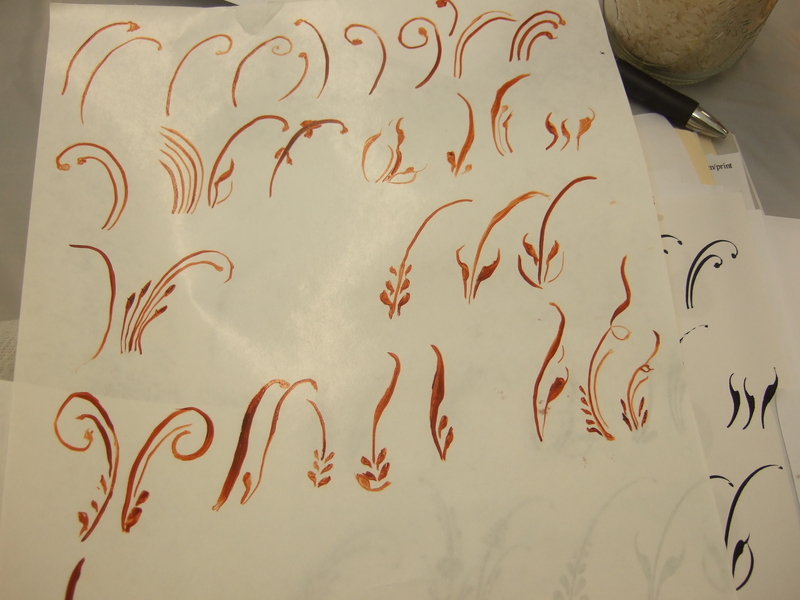 I signed up for the rosemaling class because I wanted to learn more about the art, but I had low expectations of what I could actually accomplish. 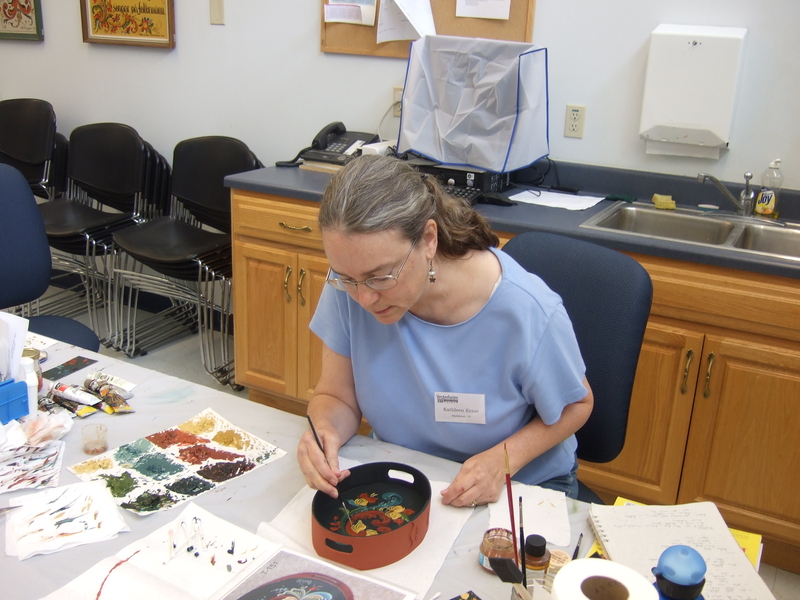 The class was taught by Joanne MacVey, an expert who earned her Gold Medal in rosemaling (which is not easy to do) in 2001. She is a lovely person, and a calm and encouraging instructor. She had us begin by practicing basic strokes. My practice work. Note the many wobbles. 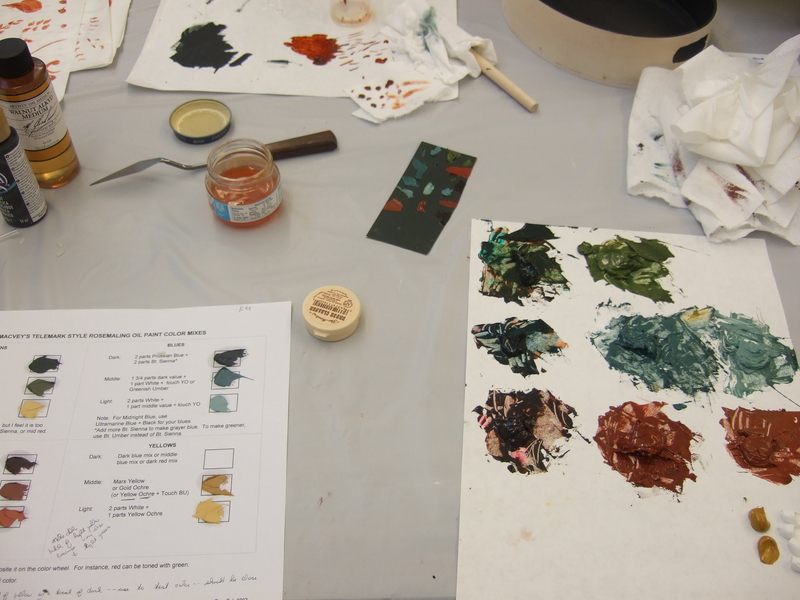 Then we mixed paint for our projects. That part was kind of fun. I did learn that my eye for color needs developing. 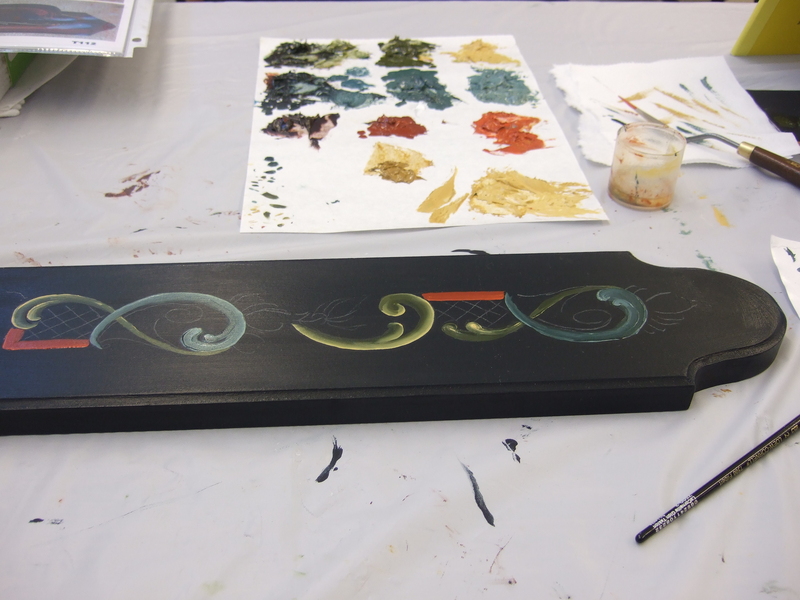 Joanne soon had us moving on to our wooden project piece, a bentwood tray. (I was dubious. Shouldn’t we spend more time practicing?) Making that first stroke was the hardest. and she made it look easy. That's me, working on my own piece. Bit by bit, the pattern came together. Much to my surprise, it was recognizable. My very first rosemaled project. The beginner class was three days. I opted to stay two extra days for an advanced beginner course. For that, we painted a mangletree. 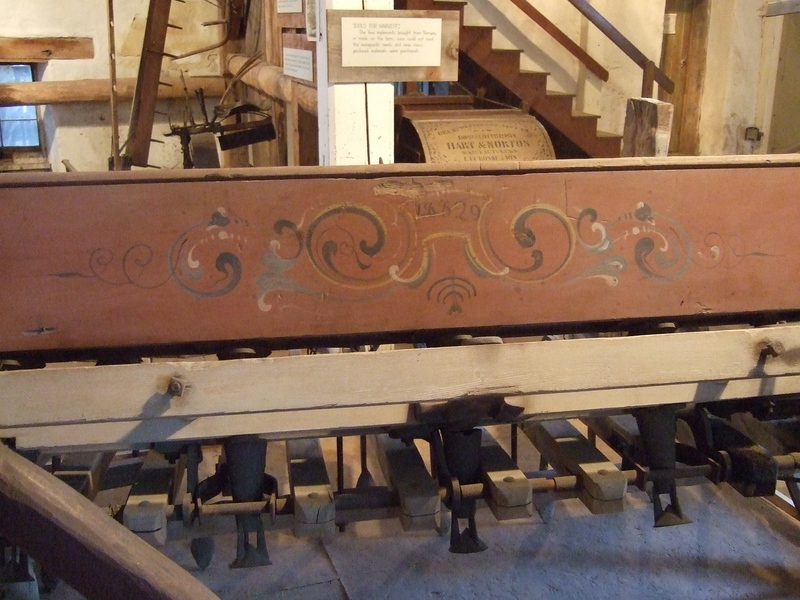 Mangles, as they are often called, were historically used to smooth wrinkles from cloth. They were also created and offered as betrothal gifts. My mangle, with just the first few scrolls painted. Here (two photos below) is my finished mangletree. I was astonished with (and proud of) what we were able to accomplish in such a short time. I credit that to having a superb instructor. Vesterheim is the perfect place to take a class in one of the traditional folkarts. The museum’s extensive collections are made available to students for study and inspiration. 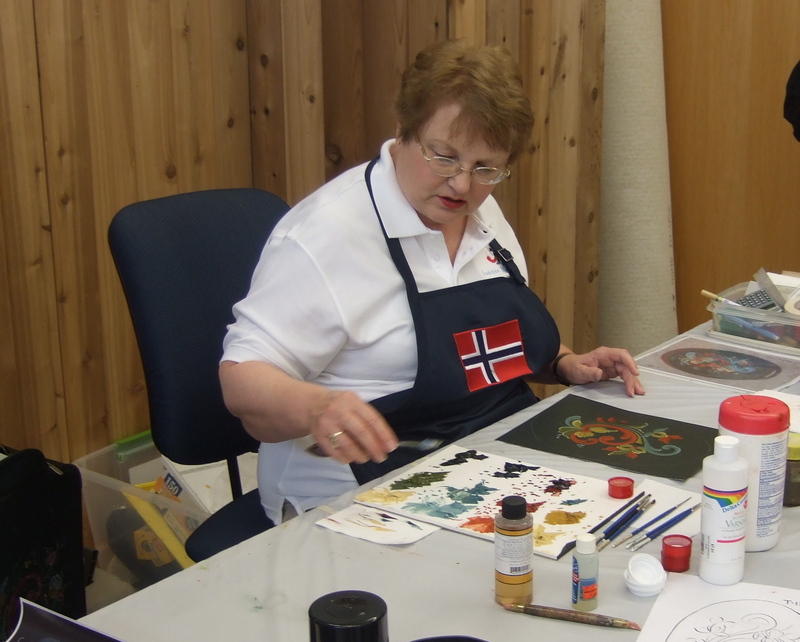 I was also lucky enough to be there during the annual National Exhibition of Folk Art in the Norwegian Tradition. Artists who are awarded ribbons in the show earn points; enough points accumulated over the years earn the coveted Gold Medal. Some of the stunning pieces entered in this year's exhibition. 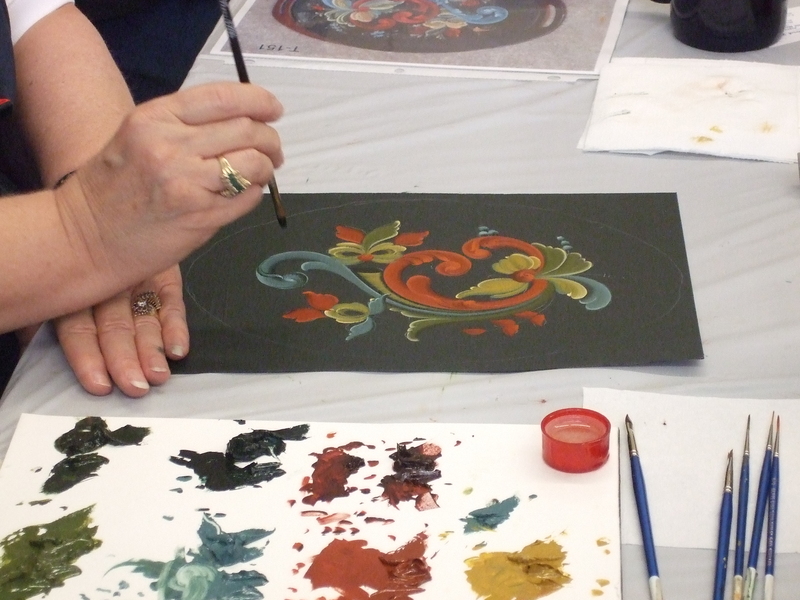 I went to Decorah to learn about rosemaling; I discovered that I loved doing it. I will never become an expert rosemaler, but I like to think that my tentative brushstrokes have become part of the continuum, helping to keep this vibrant art alive.